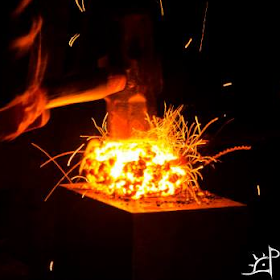 Over the course of my endeavours in bladesmithing, I have come across a vast amount of knowledge as it pertains to the chemistry behind steel, its origins, refinement, heat treatment, and formative processes which turn rocks into swords. In the interest of paying it forward, I decided to begin constructing a document which outlines the basic differences, processes, and general information to help eliminate the misnomers and misinformation that I often hear. Part II will follow in the next few weeks after I consolidate information as it pertains to heat treatment and the micro-chemistry of steel. Until then, below is an introduction to iron, steel, and the varying methods of processing ore and its subsequent refinement. Because I myself am far from an expert on this information, the information here may be periodically updated or expand upon to ensure everything is as accurate as possible. Ore- Any mineral aggregate that contains extractable metals that are bound in the mineral's crystalline structure. Magnetite- Naturally occurring ore with the highest average carbon content of 72.4% in the form of Iron (II,III) Oxide, Fe3O4. In its natural state, it can be either non-magnetic, or magnetic (called lodestone). In its pure state, Magnetite acts as a passive rust layer which inhibits further oxidation when exposed to a corrosive environment. Chemical bluing involves the formation of a thin Iron (II,III) Oxide layer on the surface of iron or steel. Taconite- A silicate crystal (usually in the form of quartz and chert) laced with iron. Although typically trapped as magnetite, the 25~30% iron content can also be composed of hematite. Iron Sand- A variety of sand which contains fine magnetite along with trace amounts of other alloying elements. Hematite- (Ferrous ferric oxide) Second highest carbon containing, naturally occurring ore with C~69.9% in the form of Iron (II) Oxide, Fe2O3. Red rust is Iron (II) Oxide, which readily forms when exposed to water or corrosive environments. When exposed to oxygen and sufficient thermal energy, it can be converted to Magnetite. Specular Hematite- Hematite is naturally found in a variety of forms and colours, the most metallic of which is called specular hematite. It is an area differential form with skewed co-linear/planar isometric lattices of Iron (II) Oxide. It derives its name and silvery reflective colour from the specular diffraction of light off the random variant angled layers, which each reflect light in parallel rays (as opposed to diffuse which scatters and has a matte reflective surface). Wüstite- FeO. Found in this state most commonly in native iron and genesis in non-atmospheric space (meteorites). Wüstite strongly interacts with silicates, oxidizes to form goethite-limonite, and in reduction/oxidation reactions with various minerals. Some of the related forms stem from Magnesium (periclase, brucite, diopside, magnesite, olivine, etc. ), Calcium (wollastonite, enstatite, diopside), Silicon (pyroxene, olivine, etc. ), and Carbonites amongst others. Iron Hydroxides- There are two major sources of iron that come from iron hydroxides (OH group), each of which yielding a significant percentage of iron when reduced. Of Goethite (FeO(OH), approximately 63% iron content and commonly used as pigments) and Limonite (FeO(OH).n(H2O)), Limonite is more commonly associated with iron ore. Limonite has historically been one of the major sources for iron, and is the primary constituent of bog ore.
Ironstone- An iron based sedimentary rock that once provided a source of iron until more accessible and higher yield (magnetite and hematite) were made available. The yield is relatively low compared to other ores. Native Iron- Telluric Iron. A non-ore based concentration (metallic form) of iron. Rarely occurs naturally except in the region of Disco, Greenland. Although it shares a strong resemblance with meteoric iron, the nickel content is significantly lower. The nickel-iron crystals form a distinctive Widmanstätten pattern of lamella (small sheets, in this case varying between Taenite [high ratio of nickel] and Kamacite [high ratio of iron]) at 60 degree angles. Type I- A natural form of cast iron with Carbon between 1.7~4% and Nickel content between .05~4%. Found in large metamorphosed igneous rocks varying from tonnes to tens of tonnes in weight. Type II- Comparable nickel content to Type I native iron, but with far less carbon, usually less than .7%. Type II is much easier to work due to the lower concentration of carbon, worked easily into iron based tools (knives). Rather than being entwined in the metamorphic rock, Type II native iron formed in small granules trapped inside volcanic basalt, although it is not uncommon for the grains to be sintered (fused without being first melted- forge welding is a form of sintering) into larger masses. Meteoric Iron- A form of native iron that originates outside of earth. It has a lower carbon content and higher nickel content than terrestrial native iron. Meteoric iron exhibits the same Widmanstätten patterns of lamella. There are four forms of meteoric iron which are distinguished by their relative nickel content and crystalline structure with iron, most notably as the iron carbide Cementite. Lesser Iron Containing Ores and Minerals- Many other non-precious ores contain iron in the lattice due to its natural abundance and ability to form 8 different oxidation states, and exist as an amphoteric (acidic or basic) oxide. As a result, traces of iron usually cohabit other common metals in that metal's primary ore source, although the yield of iron from extraction is uneconomical due to sacrificial losses of the other alloying element after which the ore was likely harvested to obtain. Pyrite/Iron Pyrite- FeS2. Also called Fool's Gold. Because of its ability to spark when struck, it was revered for use in early firearms. Over the centuries, iron has been processed in a multitude of ways, each of which yielding a distinct form of iron or steel. Modern steel is produced largely by precise, crucible processes that result in a relatively homogeneous, high tolerance alloy. Such alloys and the effects of the alloying elements will be discussed later. Below is an examination of the processed forms of iron and their distinction from one another. Iron- A ductile transition metal that, in its most stable form exists as Fe-56 (26 protons), and is one of the most stable nuclei of any element. Iron has two molecular structures, body centred and face centred cubic (which are important for the hardenability of steel). Second only to oil, iron is the most driving extraction-economy in the world. Annually, the world's processing of iron ore exceeds 1,856 million tonnes. Steel- Steel itself is, in its simplest form, an alloy of carbon and iron. Various other alloying elements can be introduced to change the properties of the steel, such as corrosion resistance, strength, impact resistance, and high temperature applications. A continuation of the discussion of Modern Steels can be found in its own heading below. Carbon Steel- I find this to be one of the most poorly named 'types' of steel, given that all steel has carbon in it. However, specifically Carbon Steel is any ally of steel with .12~2.0% C content. The American Iron and Steel Institute more specifically defines Carbon Steel by its constituent alloys (no specified range for carbon content). There is a maximum percentage for Manganese (1.65%), Silicon (.60%), and Copper (.60%). However, there is no minimum value for chromium, cobalt, niobium, molybdenum, nickel, titanium, tungsten, vanadium or zirconium. Pig Iron- The resultant reduction of iron containing ore through a blast furnace, usually 3.4~4.5% C, brittle by nature, and mixed with dross (solid mass of impurities; equivalent solid of slag, which is by definition liquid), strongly consisting of silicates. Intermediate form of steel as a result of smelting in a carbon rich environment. Historically refined into wrought iron. Pig iron derives its name by how it is cast into ingots, resembling piglets suckling a sow. A row of the molten pig iron is poured into a sand mould, to which triangular ingots branch off to either side where they are broken off after cooling. Puddle Iron- To refine pig iron, ingots were layered in a puddling furnace, similar to the ore/charcoal layers of a bloomery furnace. After the ingots melted, the liquid metal would form a puddle at the bottom. A combination of stirring and the passage of air over the surface allowed diatomic oxygen to react with the liquefied slag (silicon, manganese, phosphorous, and sulphur), which would react to form gaseous byproducts and purify the liquid steel. The carbon content is also reduced from the cast iron range into wrought iron (less than .1%) by forming gaseous carbon dioxide. Blister Steel- 1.2~1.8% Carbon steel carburized from wrought iron through cementation. Because of carbon migration and diffusion, the carburized bars have a gradient of carbon from the edge to the centre. Although the process originated in Prague, cementation is most notably remembered in Sheffield, England. Shear Steel- To further refine and homogenize blister steel, the carburized members are sintered (forge welded) together and forged to a smaller cross section which will have a more uniform carbon distribution. The resultant is shear steel. Wrought Iron- A low carbon iron alloy, ranging between .04~.08% C, which contains comparably large amounts of slag. The grain of the wrought iron has a distinct direction and composes up to 2% of total mass. Cast Iron- 2.1~4% Carbon containing steel, usually alloyed with silicon in the range of 1~3%. Excepting malleable cast iron (either Blackheart, Whiteheart, or Pearlitic malleable iron depending on the pearlite/ferrite matrix produced in heat treatment), cast iron tends to be brittle and difficult to work. Originally cast iron was a resultant product of pig iron. Depending on the ration of carbon to alloying elements, and the respective banding of these elements, cast iron has two basic forms. Grey Cast Iron- Predominating structure is composed of carbon based allotropic graphite. This is the most common form of cast iron, and produces a grey granulated surface when broken. Due to the graphite concentration, which is stabilized by the presence of silicon, internal stress is distributed as a polyhedral array. Resulting cracks propagate in dendritic fractures across the graphite flakes. When broken, the exposed surface is grey in colour. White Cast Iron- Predominating structure is built by carbide strands, most predominantly iron carbides but with additional slag element based carbides. These carbides allow stress and cracking to pass straight through the material unopposed, which when broken yields a white granulated surface. Bloomery Steel- (Sponge Iron) The product of reducing iron oxides (ore) into a bloom, a porous combination of metallic iron and slag. Iron is precipitated from the iron oxide and removed from the silicates encasing it. In its unrefined form, bloom is high in slag and unusable without consolidation. Layers of ore and charcoal or coal are fed into the chimney of a bloomery furnace where the melted iron collects at the bottom, allowing it the possibility to carburize (based on the burn rate, air flow, fuel, and a number of other factors). The position of the tuyere, a pipe through which air enters the furnace, in the furnace itself will also vary the carbon content of the bloom. Tamahagane- The equivalent of sponge iron, which translates to Jewel Steel. Tamahagane results from the bloomery process and in this form is no further refined. Oroshigane- In Japanese metallurgy, Oroshigane is sword quality steel that is the product of refining tamahagane. It is not uncommon for the bladesmith to refine the Tamahagane in order to produce more exacting specifications for the piece it will become. Hearth Steel- Steel refined or altered from one pre-existing metallic state to another through melting. A variety of different constructions for open hearth furnaces, such as Aristotle or Evenstad furnace, which can both purify, consolidate, and carburize/decarburize the input steel or iron. Blooms are not made in hearths. Crucible Steel- Original crucible steel involved the melting of iron in excess of carbon to carburize the resultant puck into steel. In modern context, crucible steel has become in some ways comparable to wootz when the dendrites form upon cooling of the liquid steel matrix. Carburization is still possible, however it is not necessary for the formation or consolidation of steel in a crucible. Brescian Steel- Carburized low carbon steel by exposure at high temperatures to liquid steel with a very high carbon content, usually of cast iron or higher. The Paal, or Brescian process, originally involved taking a solidified bloom and submerging it in liquid cast iron (which has a lower melting point than lower % carbon steels) for a length of time until the carbon of the cast iron migrated into the lower carbon bloom. This was performed in a hearth, but has in modern times come to involve the carburization of homogeneous steels in cast iron melted in gas or induction furnaces where temperature control is more precise. Wootz- Of Indian origin, possibly specifically to Persia before the spread of the ancient steel making process, wootz is a high carbon steel ranging between 1~2% carbon. Archaeological evidence suggests that wootz was made as a crucible steel in large, mound shaped furnaces as described by the late 17th century archaeologist Francis Buchanan. Although the precise mechanism for modern reproduction of the ancient wootz steel is unknown, the distinctive dendritic carbide grain pattern has been achieved in small scale crucible steel. For its time, wootz was far superior to the other refinement methods of steel and vastly out performed its peers in both strength and hardness. The word wootz itself is an adaption of the Persian name for steel. Damascus- Much like wootz, modern knowledge of the original Damascus steel has been lost. It is theorized that Damascus steel was the product of the Persian knowledge being brought to Damascus, Syria where smiths could process the wootz into tools and blades. The distinctive damascene pattern that resulted in such pieces were a result of the texturing (a metallurgical term for the partial alignment of crystal grain boundaries due to mechanical deformation) represent rippling or waves. These patterns were made visible through polishing or etching. In modern times, Damascus is often used in reference to Pattern Welded steel, where similar patterns are a result of multiple, alternating layers of different alloys (such as 1080/15n20) where one metal is has different hardenability or chemical resistance from the other. Pattern Welded Steel- A generic term used to describe the forge welding (or fire welding) of alternating layers of different steels or likewise weldable materials into a billet in order to produce a visual pattern in the finished piece. Perhaps the most common is 'random pattern' in which nothing is done to the layers beyond welding and folding or stacking to increase the layer count. Ranges in the tens of thousands of layers is not unreasonable, as each time a billet is folded in half, the count is doubled (or tripled if cut in thirds, quadrupled in fourths, etc. ), and thus increases rapidly. With certain processes done to the billet at certain ranges of layers, other effects can be produced when brought back to flat. Historically, twisting was used in the edge and core of pattern welded swords and knives. Other patterns include, amongst others, 'raindrop' in which holes are partially drilled through the billet to produce concentric rings; 'ladder' in which lines are cut down the width; 'feather' in which a hot cut is used to bisect a billet which is then welded back together to produce what appears as the quill of the feather; and many others. Straight laminates are considered low layer pattern welded billets in which the layers remain relatively parallel, running the length of a piece. Mosaic- A type of pattern welded steel, usually called Mosaic Damascus, in which a pattern is produced through can welding (the placement of metal bits in a 'can' and surrounded by metal powder and sealed, which is fused solid by internal pressure at high temperatures). Mosaic Damascus can result in the formation of complex shapes and is generally limited to what can be cut into the bits placed in the can. Such decorative patterns are often contemporary in appearance and used in art knives. Lamination- The welding of an edge piece of steel inside two contrasting metals. When ground, the edge steel is revealed midway between the spine and edge of the blade, and when etched, the two layers are revealed for their distinction. Commonly wrought iron is used for its slag grain pattern as the outer two layers, but anything that can produce contrast when etched may be used. The outer layers may be non-hardenable or hardenable, stainless or carbon steel, or even non-ferrous materials such as nickel. 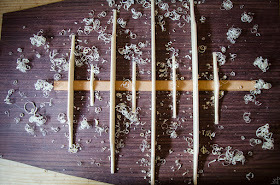 San Mai is a Japanese term similar to laminated billets. Other variations of pattern welding include fused cable, termed Cable Damascus, welded chain (motorcycle, bicycle, chain saw, etc. ), an assortment of scraps, or anything that can be welded together and refined into a solid billet. When using bloomery steel, meteoric iron, hearth steel, or crucible steel, pattern welding may involve refined billets from different batches of production or different methods altogether.